Johnson’s Baby Skincare Basket Giveaway! This post was sponsored by Johnson’s Intense Moisture Cream & TheMotherhood. All opinions are my own. Well it’s winter…basically. It snowed yesterday, so I guess that means that the glorious days of Fall are behind us. Bring on the holidays, snow, hot chocolate, and comfy boots! Unfortunately, it also means dry, chapped skin. My kids are always the worst victims. Every time we would come to visit Utah (back in the days before we lived here, obviously) Will’s lips would get raw and red, his arms and legs would flare up with excema. So all our fun cold-weather activities (sledding, building snowmen, seeing Christmas lights at Temple Square) were that much more miserable. Not this year though. Johnson was so kind as to send me a Baby Skincare Basket to use on my kiddos. It was chock-full of awesome skin care products, but I was especially excited about the Intense Moisture Cream. This is what they need! Something to keep that dry skin at bay, without having to reapply over and over all day long. Do you want to try some? 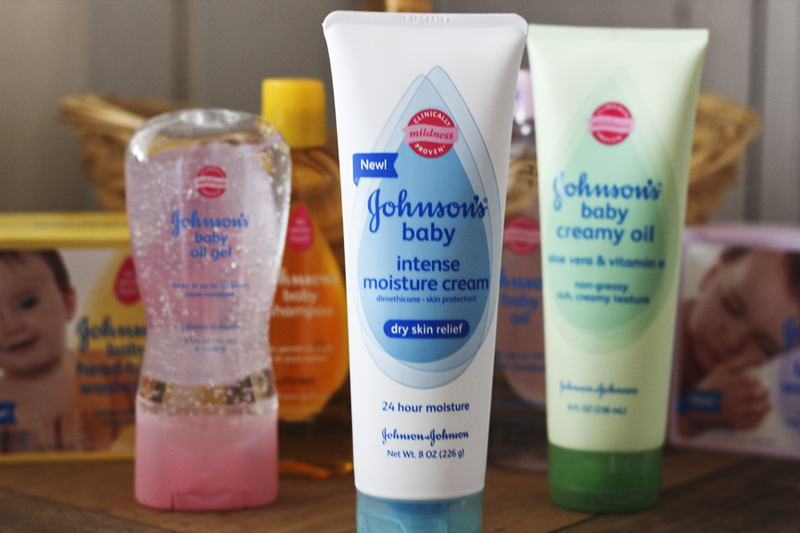 Today you can enter to win your own basket of Johnson’s baby skincare products! Enter the Rafflecopter below. And don’t miss the Johnson’s Twitter party is next Wednesday, Nov. 13, at 2p ET, and the hashtag is #JOHNSONSBaby. I have a 3mo. old so I need some good skincare products for him. My poor 4 year old has already started getting horrible dry patches from the change in seasons. Trying different products to find what will help her get through the winter with the least discomfort so she can go back to being a child and playing in the snow. I have a soon to be great niece and her and her mom would love this. I have 3 girls who have really dry skin and we are alwqys looking for something to help. Would love to win this and see how well it works. My 19 mth old twins could use more lotion! We go though it like crazy – especially in the winter months. My first baby is arriving early next year. I want only the best for them! All my kids have really dry skin in the winter and this would be great to have! My 3 year old gets really dry skin. I’m always looking for something to help! HI, BECAUSE MOM’S LIKE SOFT SKIN TOO! My kids have very dry sensitive skin. The moisture cream looks fabulous. I’ve got two kiddos and winter is brutal here! I have a boy who turns into a lizard in the winter. His hands get so dry they crack and bleed. It is very hard to keep little boys soft. I daughter just had a little boy – precious grandson-this would be perfect. I would love to give this to my sister and brand new niece! I would love this basket for my grandchildren who have inherited my dry skin! Great for gifts and to bring to Cuba when I see my family there. I have 3 baby girls who are the love of my life. I love nothing better then to slather them in baby lotion after their baths. The smell of a clean little one after their bath is the bes! One of my friends is expecting her second baby soon; this would be a wonderful baby shower gift for her. Our 2 youngest girls have skin problems, would like to have for them. I would gift this to my best friend who has a 4 month old little girl that could use these! I have 2 babies who are prone to dry skin and would love this!! I love Johnson baby products and this would be nice for my great niece. I’d like to win because I’m expecting my first baby this month in just a few weeks! We don’t have any bath products for her yet. Thanks for the opportunity. I have a nephew that could use this gift basket. Thanks! My BFF just had her 3rd baby, finally a GIRL & Johnson’s baby products smell better than ANY other product on the market for babies!!! I LOVE that smell!! It’s exactly what I need for sensitive skin boys! I would like to win to share this with my niece who just had a baby boy. I have 4 kids aged 5(almost 6!) and under so this would come in handy! My kids have very sensitive skin and I live Johnsons baby products! This would be great for my baby. I just had two grand-babies born this past week and they could both get a lot of use out of this wonderful gift basket. I would like to win because I have two beautiful grand-babies that could really use this. I would love to give this away at a baby shower! I’m having a baby in May! My very first! And a basket of baby products would be oh-so-wonderful!!!! I want to win so that I can take care of my little boy’s dry skin. I want to win to help out my baby;s dry skin! I’m expecting my first in Jan. I love when the grandkids (all 7) stay the night! The bath & “rubdown” is my favorite part. Love the Johnson’s products so much. I want to win as this would be great for my grandson! It will be for my little baby!